We knew there was a reason we spent all that money on night vision goggles! 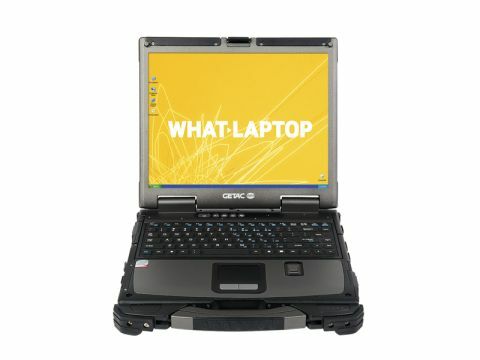 Getac is a company that specialises in building rugged devices, from handheld computers, through tablets, to full-sized laptops. The B300 is one such laptop and has many of the same rugged ratings as the Dell Latitude E6400 XFR, alongside some nice features. The Getac's magnesium alloy case looks and feels extremely tough, and indeed boasts many of the same rugged ratings as the Dell. The Ingress Protection rating of 65 makes it invulnerable to dust and capable of withstanding sustained exposure to jets of water, and the laptop also passes the tests set by the US military's MIL-STD-810G rating. This means it's capable of operating at the extreme temperatures of 60˚C and -29˚C and can also be dropped from as high as three feet and still continue to operate. The laptop has several features which will appeal to those linked with covert operations. A Black Out function means that it's possible to kill all sources of light on the machine – such as the backlit keyboard, screen and even status lights – useful for those looking to remain undetected in the dark. There's also a clever Night Vision mode – exclusive to this machine – which makes the laptop panel readable with night-vision goggles on. As with the Dell, the Getac's 13.3-inch screen is both shock-protected and touch-sensitive. The latter works, but is much less sensitive than the Dell's and navigating through the operating system isn't as swift and seamless as we would like. The 1024 x 768-pixel resolution provides pictures that aren't particularly sharp, although reading word documents and spreadsheets is still easy. We mentioned a major design flaw above and in this case it's the backlit keyboard. To ensure water and foreign objects don't get into the system through the keyboard, Getac has used a one-piece rubber design. As a result the laptop qualifies for fog and salt protection standards, and is safe to use in oceanic conditions – on an oil rig, for example. We tested the keyboard using both bare hands and gloves and, due to the thick rubber design, found it extremely hard to use. Although it has been designed primarily for inputting data – in which case we're surprised there isn't a dedicated number pad included – the keys very rarely register on the first attempt and the whole experience is irritatingly spongy. The unfortunate result that if you expect to type, or input data, on a regular basis the machine is borderline unusable. Performance is decent enough for office work, but portability particularly impressed us. The 427-minute battery is excellent, meaning you can spend time in the field without panicking about running out of power, unlike the Dell. Overall, the Getac B300 is a really difficult proposition. Protection for your machine is excellent – although just pipped by the Dell – and there are innovative features that some will find invaluable, but the keyboard is truly terrible and ultimately a major deal-breaker for us.